The Honourable Mrs. Justice Zaila McCalla followed by Ms. Justice Hillary Phillips and Mr. Justice. Patrick Brooks lead the procession of judges and lawyers at the annual service. 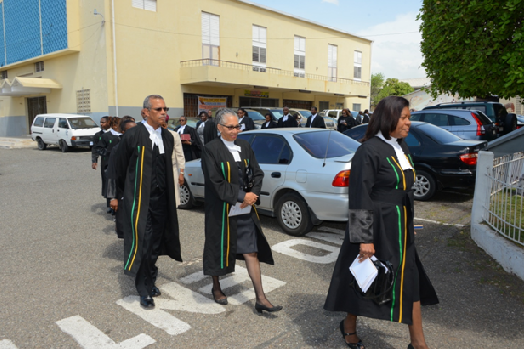 On Sunday September 14, 2014 members of the Jamaican Judiciary and the legal fraternity dressed in their court attire, processed into the church led by Reverend Dr. Roy Henry for the annual Assize Service at the East Queen Street Baptist Church, marking the start of the 2014 Michaelmas Term. Chief Justice the Honourable Mrs. Justice Zaila McCalla, OJ in her greetings to the congregation, indicated that this term comes with new developments to improve customer service delivery in the justice system. The Chief Justice went on to make the point that improved customer service delivery, would significantly benefit the citizenry which judicial officers have sworn to serve. Chief Justice McCalla further shared with the congregation that a relocation exercise would take place very early in the term, with the refurbishing of the Old NCB Building adjacent to the Supreme Court. Three additional court rooms would be commissioned bringing to 15 the total number of court rooms to deal with matters at the Supreme Court. Mrs. Justice McCalla stated that plans were in the pipeline to relocate the Civil Registry to the new location. This would address the issue of misplaced files due to a lack of adequate space at its present location. This year’s Assize Service took place under the theme “Building Trust Through Justice” and was attended by dignitaries, who joined in worship through the arts to include a special item by Attorney-at-Law Mr. Franklin Halliburton and a dance by members of the of the Office of the Director of Public Prosecution. The Assize Service is a European tradition dating back to the middle-ages. The practice was exported to the British colonies during the 17th century and is a tradition which the Judiciary and legal fraternity in Jamaica has maintained. The service usually occurs on the Sunday preceding the opening of the Michaelmas Term each year. The purpose of this service is for the legal fraternity to gather in worship and invoke God’s blessings on those responsible for the administration of justice for the new judicial year.